Edwards fits the mold of a sixth man. This season, Brandone Francis was great coming off the bench. He brought energy, defense, and shooting to the floor and was regarded as a starter by Chris Beard as Francis played as many minutes as most of the starting five. Kyler Edwards also had a bench role and came on the floor mostly for scoring early on this season but grew into a better defender as the year went on. Could he turn into a great sixth man for the Red Raiders? 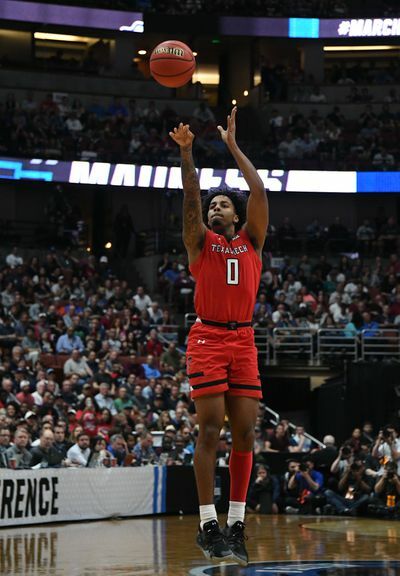 With Francis graduating this season, there has been a void left at the sixth man position for the Red Raiders. I think that Edwards is the guy to replace Francis at this position, he may even start at shooting guard next season. I personally believe that true freshman Jahmius Ramsey is going to start at shooting guard immediately going into next season. His size, defensive ability and athleticism are perfect for Beard’s system and I believe that he will start right away and play a ton. This might not be an issue for Edwards. He is a great offensive player and might just be the energizer needed to come off the bench, just like Francis was this season. His shooting and offensive smarts could be great for when this young team gets off to slower starts. Edwards got much better as the season went on. His defense was above average and that will only get better. He could potentially become a guy that can guard three different positions. This combined with his shooting could make him a formidable force coming off the bench. Coach Beard has talked in the past about the sixth man being one of the best players on the team, even better than some of the starters. While I don’t know exactly what the starting lineup will look like next season, I do think that the sixth man will be one of the five best players on the team, and I think looking at the roster, Edwards would fit the role very well. No matter what, Edwards will be a crucial piece in making another run at a title. His shooting alone makes him a threat no matter if he starts or not. Do you think Edwards fit the mold of a sixth man? Let us know in the comment section below!